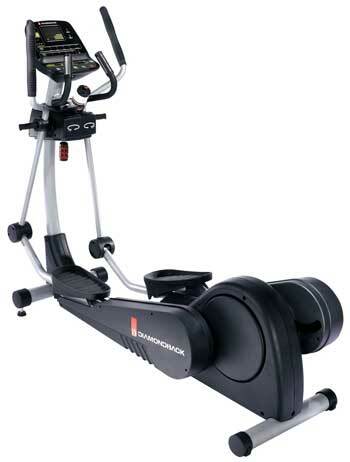 Diamondback 1190 Er Elliptical is a new generation elliptical which has patented 21 inch elliptical stride and a next gen new programmable console. Diamondback 1190 Er console comes with 20 intensity levels and 4 HR interactive programs with contact sensors. Simulates the body’s natural walking motion for a natural and comfortable feel. Provides the ability to change your workout difficulty. Enables you to adjust the position for a custom fit. Provides easy program set up and understanding. Provides numerous workout options to maintain motivation. Keeps heart rate in ideal training zone by automatically adjusting intensity. Hands free operation while monitoring HR. Most accurate sensing of pulse with Polar® compatible receiver. Displays heart rate information during entire workout. Provides exceptional comfort during your intense workout. Frame: Weld heavy-duty steel frame. Side Cases: High Impact Plastic. Bearing: Sealed Ball Bearing in Bottom bracket and other areas. Foam Grip: Custom Krayton rubber comfort grips. Foot Pads: Extra large EVA foam cushion pads. Patented, natural, 21″ elliptical stride. BodyFitTM Adjustment System, features 3 ellipse angle/position adjustments. 4 HR interactive programs with contact sensors and HR telemetry receiver with chest strap. New Programmable console with scrolling instructions menu. 6 Upgraded conventional programs with 20 levels of intensity. New delicate pulse & %HR bar graph display.